We made the minimum payment of $278.97 for the first 26 payments, then increased the payment to $500.00 once we paid off our car. We have made 4 such payments, are seeing the increase in our principal payment every month. While doing my taxes this year, I decided to add up the total principal just to see how far we've come. What I found has me completely confused: it turns out that we have, over the life of the loan, paid $6,072.26 to principal alone (this information comes directly from the "Payment History" of our loan management website). Now, I didn't have to go to college to learn that 20,800 - 6,072.26 = 14,727.74. That's what I would expect the current principal balance to be. 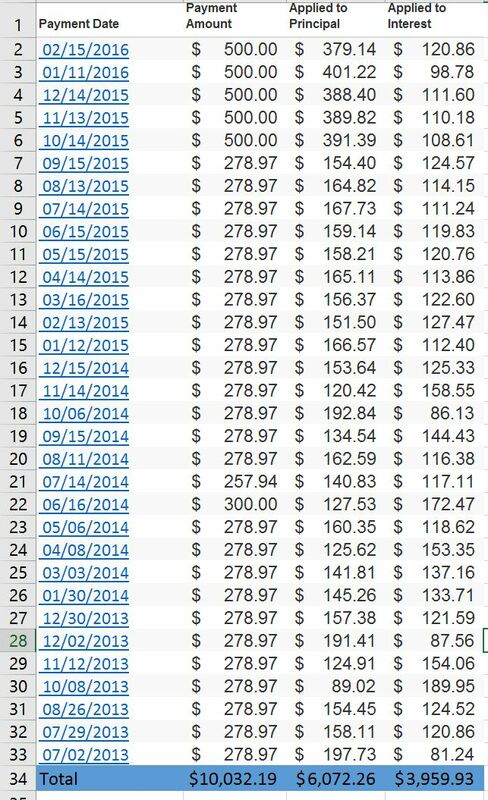 However, on our "Loan Summary" page, the remaining principal balance (not including interest accrued) is $18,168.56. With interest accrued in the last month, it's $18,259.89. I feel like I have at least a basic understanding of how interest accrual works (having spent a great deal of time reading through this site's answers), but this has me completely stumped. Before I call the loan customer service and ask what's going on, I felt it would be wise to make sure I'm not missing something completely basic. If this is really just how it's supposed to work, I may as well just take the extra car payment money and put it to some other use! My ultimate question is: why does the value for "remaining principal balance" differ from what I can prove that I have paid in principal over the life of the loan? which almost exactly matches your current balance statement of $18,168.56 a difference of 51 cents. Is it possible that during the time you were in college the accumulated interest caused the balance to grow from 20,800 to 24,241? This could happen if the loans were unsubsidized. Not the answer you're looking for? Browse other questions tagged loans debt student-loan debt-reduction or ask your own question.